Centerpoint Development Partners (“Centerpoint”) initiated its acquisition of 803 North Milpas Street in June 2005. Jarrett Gorin, AICP negotiated the purchase and sale agreement for the site and subsequently managed the design and discretionary entitlement process for this 19,407 square foot mixed-use infill project. Centerpoint terminated its operations in mid-2009 and retained Vanguard Planning to obtain the final project approval. 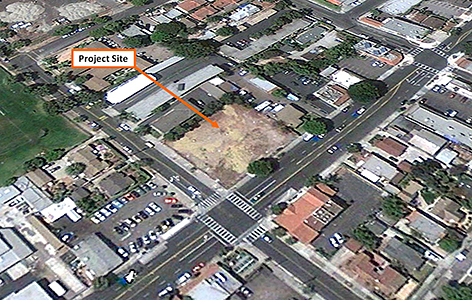 The subject property is located at the intersection of Milpas Street and De La Guerra Street. Milpas is a major commercial corridor with over 29,000 average daily vehicle trips and heavy pedestrian use. De La Guerra is a primary cross-town route between Santa Barbara’s Riviera and its downtown core. The site’s location, adjacent to the signalized intersection of two busy streets, makes it an excellent location for neighborhood-serving commercial development, and its zoning allows for development of residential units in addition to commercial space. A project with ground-floor retail and residential units on upper floors was quickly determined to be the highest and best use for the property. Commercial development would benefit from exposure to heavy vehicle and pedestrian traffic on Milpas, and residential units could be provided at a location close to downtown and existing neighborhood-serving commercial services. The residential units would also enjoy Riviera and City views. The Site: The 21,756 square foot project site (see aerial photo at right) was formerly occupied by a Chevron service station. Various service stations had operated here continuously since 1953. Underground fuel tanks associated with these uses had leaked, contaminating the soil and groundwater beneath the site. Chevron’s station was demolished in August 2004 concurrent with the start of an operation to remove contaminated soil. The property had open groundwater and soil remediation cases when Centerpoint initiated its acquisition in 2005. 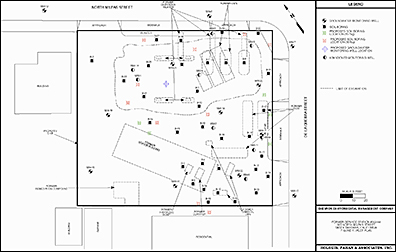 Six active and nine abandoned groundwater monitoring wells exist onsite (see exhibit below left showing monitoring well and soil test boring locations). These needed to be addressed as part of the planning effort. The soil remediation case was expected to be closed prior to project construction. However, the groundwater case could remain active for decades. Mr. Gorin worked with legal counsel to negotiate an indemnity and access agreement with Chevron, providing for ongoing remediation and obligating the former service station operator to defend Centerpoint and its successors against legal claims associated with existing contamination. He also worked closely with Santa Barbara County LUFT/SMU staff to determine how active monitoring wells would be relocated within the proposed development, and to identify cost-effective mitigation measures that could be incorporated in the project design. This was essential to obtain discretionary approval prior to completion of the soil remediation work. Project Features: Mr. Gorin worked with DesignARC, a Santa Barbara based architecture firm, and Huitt-Zollars, a national civil engineering firm, to develop a mixed-use concept (see site-plan at right). The plan includes 3,195 square feet of ground-floor retail/office space, six two-bedroom condominiums, and two three-bedroom condominiums. Development is divided into three buildings to address mass bulk and scale issues. All structures are three stories except a commercial condominium at the street corner. This 1,138 square foot space is suitable for a wide range of tenants t whome a high-visibility location is desireable. The third story of all structures is substantially set back, reducing apparent height, and providing an opportunity for large roof decks (see Milpas Street Elevation at top of page). All residential units include a private two-car garage with interior access. A motor court provides commercial parking, and a paseo facilitates access between the parking area and office/retail spaces on Milpas Street. 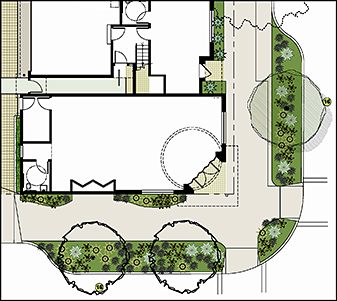 The Western corner of the site is occupied by a landscaped open space visible from every residence in the project, and from existing and future residential units on adjacent properties. The open space provides aesthetic benefits, and is also used to impound and infiltrate stormwater runoff. Two residential-only condominiums serve as a buffer between commercial uses on the site and an existing apartment building next door. 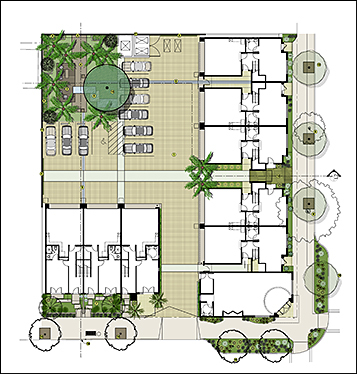 Each of the five units along Milpas Street include residential and commercial space. Residential entries are accessed from the interior motor court and commercial entries face Milpas Street. These mixed-use units have a flexible design with optional interior access between the commercial and residential components. The office/retail spaces include private ADA compliant interior restrooms, allowing them to operate as stand-alone rentals. Each owner can use their condominium as a live/work space, or lease the commercial component to another party. 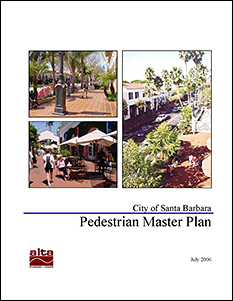 Processing Delays: A mandatory pre-application for a Tentative Subdivision Map, New Condominium Development, Development Plan, and Parking Modification was filed with the City of Santa Barbara (the “City”) on August 29, 2006. The site-plan, landscape plan, and elevations were conceptually approved by the Architectural Board of Review on May 14, 2007. The project team worked with staff to further refine the project over the next six months, and the discretionary applications were deemed complete on November 15, 2007. Planning Commission review was scheduled for January 17, 2008. However, one week prior to the hearing, staff identified an error on the adopted General Plan map that would have prevented the Planning Commission from being able to make required approval findings. The City initiated a General Plan amendment to correct the error, which affected 22 properties including the project site, but did not complete the amendment until January 13, 2009. The discretionary applications were “held in abeyance” during the delay. Processing resumed in early March, and the project was placed on the Planning Commission’s August 20th agenda. When Centerpoint’s application was deemed complete in November 2007, staff’s position was to “request direction from the Planning Commission regarding how the PMP …should be implemented for this project and future projects” on Milpas. By August 2009, when the project was scheduled for Planning Commission review, this had changed substantially. Staff now cited the PMP as justification for taking 1,085 square feet of the property. In response, Mr. Gorin submitted into the administrative record a 654 page document comprising substantial evidence against the proposed exaction. Centerpoint would be able to use the information if litigation became necessary to address the City’s actions. The document cited, among other relevant facts, five approved discretionary projects (including the one next door) which were subject to PMP recommendations, and which had not been required to dedicate right of way or construct any PMP improvements. However, the Planning Commission demanded rigid adherence to the fifteen foot configuration despite evidence that the PMP was being applied to the 803 North Milpas project differently than it had been applied to any previous proposal. Rather than requesting a denial, exhausting appeals, and seeking a resolution in court, Mr. Gorin asked for a continuance in order to explore feasible alternatives with staff. Evidence of the City’s inconsistent policy implementation was now formally documented, and Mr. Gorin hoped this would motivate staff to investigate options other than the proposed taking. He subsequently determined that the fifteen foot wide sidewalk configuration could be provided if the City could be flexible on a single, non-critical standard, and the proposed structures could be shortened slightly. Staff agreed to a three foot decrease in driveway width behind the proposed structures and allowed Centerpoint to use one foot of the existing traffic lanes to construct pedestrian improvements. Mr. Gorin and DesignARC were able to reduce the depth of the structures by three feet without adversely impacting the floor plans. These combined revisions provided the additional seven feet needed to implement the PMP “Recommended Configuration” (see PowerPoint slide showing PMP implementation above). Staff also accepted Mr. Gorin’s proposal for a public pedestrian use easement in-lieu of dedicating land for new right of way. The revised project was considered by the Planning Commission, and approved unanimously on November 5, 2009. Affordable Housing Fees: The City adopted a new inclusionary affordable housing ordinance (the “IHO”) in May 2009. Prior to this, projects with ten units or less were exempt from affordable housing requirements such as provision of onsite units or payment of in-lieu fees. With the new IHO in place, staff attempted to condition the project to pay over $140,000.00 in affordable housing in-lieu fees. At the November 5, 2009 Planning Commission hearing, Mr. Gorin argued that the project’s application was deemed complete in November 2008, a year and a half prior to adoption of the IHO. If the application had not been “held in abeyance” for over a year, while the City worked to correct the error on its General Plan map (see Processing Delays above), there was no question that the review process would have been completed several months prior to the in-lieu fees taking effect. The delay could have been avoided if the City had identified the mapping error during review of the 817 North Milpas proposal in 2006 and 2007. However, the City enjoyed relief from mandatory processing timelines while the General Plan map was corrected. 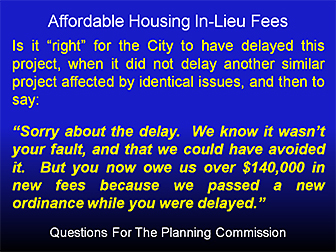 In contrast, the project was not being granted relief from payment of in-lieu affordable housing fees which did not exist in January 2008, when Planning Commission review was originally scheduled. Mr. Gorin observed that the situation was fundamentally unfair (see PowerPoint slide above right), and potentially not legal. The City Attorney agreed, and the in-lieu fees were deleted from the conditions of approval. Appeal to the City Council: The November 5, 2009 Planning Commission approval was appealed to the City Council on November 16th. The appeal was filed by an individual who had not attended either of the Planning Commission hearings or submitted any previous correspondence about the project. Several issues were identified as grievances, but it soon became clear that the corner “bulb-out” (see exhibit at left) was the true subject, and that the appeal was being pursued by a special interest group opposed to bulb-outs and traffic-calming measures in general. The City had a new Councilmember, elected on November 9th, who had run on an “anti traffic-calming measures” platform and had received campaign support from the group behind the appeal. The appellants appeared to believe the City Council would deny the project because it included a bulb-out (rather than simply requiring a different street improvement), and that as a result, bulb-outs would never again be proposed in Santa Barbara. In fact, the bulb-out had not been proposed by Centerpoint. It was added to the project at the request of staff in November 2006. 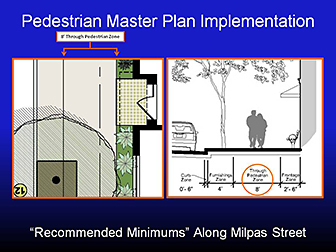 Furthermore, current City policy in the PMP (see Pedestrian Master Plan Issues above) called for installation of bulb-outs in high pedestrian use areas like the Milpas corridor. Mr. Gorin preferred to avoid an appeal hearing before the City Council, which now included three members who supported traffic-calming improvements, three members who opposed them, and one neutral member. He met with the appellants in December to negotiate a solution. The bulb-out was not critical to Centerpoint (it had been required by the City), and Mr. Gorin agreed to delete this feature if the opponents would withdraw their appeal. The appellants agreed, and the project was revised to provide standard access ramps. This change required a Substantial Conformity Determination (“SCD”) by the Planning Commission. The SCD request was considered on February 18, 2010. At the hearing, Mr. Gorin presented evidence that the revised corner design directly implemented recommendations from the PMP (see PowerPoint slide comparing revised corner to PMP example above right). Large numbers of alternative transportation supporters who viewed the project appeal as an attempt to change existing City policies promoting pedestrian improvements attended the hearing. Many spoke in opposition to the revised design, and the Planning Commission denied the SCD request. This meant that the project would remain unchanged and that the appeal would move forward for consideration by the City Council. The appeal hearing took place on March 23, 2010. In preparation, Mr. Gorin coordinated with community proponents of pedestrian improvements to ensure that there would be substantial public support for the project, and opposition to the appeal. During his presentation, he argued that if the City believed its bulb-out policy should be changed, the appropriate way to do that was to revisit the PMP, not to deny a proposal that complies with current standards. Mr. Gorin also noted that projects are usually appealed because someone asserts they are inconsistent with City policy, but in this case, his Client’s project was appealed on the basis that is was consistent with existing policy. After several hours of testimony from supporters and opponents of bulb-outs, the Council voted 4 to 3 to uphold the Planning Commission’s November 5, 2009 approval, and to deny the appeal. Copyright © 2011-2013 Vanguard Planning LLC. All Rights Reserved.